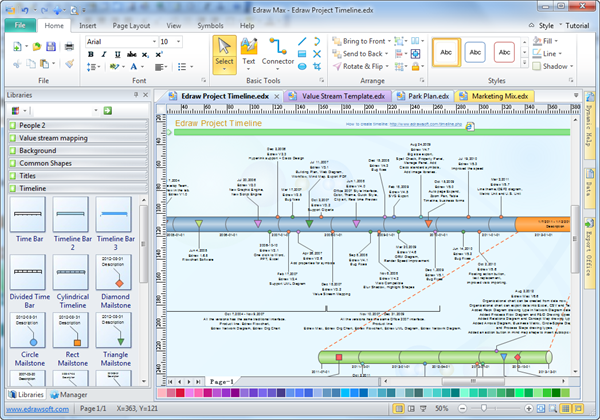 Edraw timeline maker has the tools to make it very easy in creating professional-look timelines, history, schedules, timetables and project plan diagrams. A timeline is a graphical display of relative items or events in sequential order presented along a line. It helps to record events, review the past, reform the current and receive awards in the future. 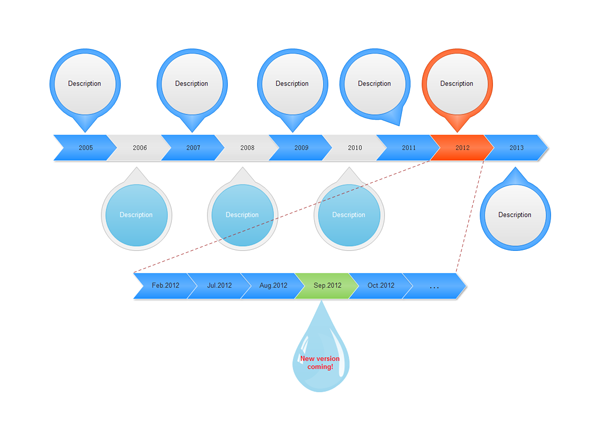 Edraw is the easiest and best-looking way to create and share project timeline. Whether you're moving into a project plan, timeline management or reorganizing your timetables, Edraw has the right tools for you. With Edraw you can recreate your timelines, history or schedules in just a few clicks. Timelines can be used by project managers to demonstrate project duration and milestones. They can be used by executives to ensure that all tem members bear in mind their deadlines. Documents management specialists can use this kind of diagrams to track program-completion date. Corporation owners can record and introduce the development process of their organizations in a visualized way with timelines. With Edraw, you will experience more difference and convenience and will be capable of creating more innovative drawings way beyond your expectation. Sophisticated templates and examples are meticulously pre-drawn. So you can directly generate stunning presentation as fast as it can be. Every time with Edraw is a good time. Even when you are in a rush, you can still show professional, elegant and infographic timelines. Sufficient symbols including common shapes, timeline and title bars, callouts are elaborately drawn. Thus, you can develop individualized timelines in a matter of minutes with drag-and-drop functionality. Floating control button and selection handles tied with the shapes for immediate change of shape size of location. Free Support. Got a question? Feel free to email us. Edraw experts are always standing by ready to help, for free. Edraw includes some free timeline templates to help create project timelines from examples. 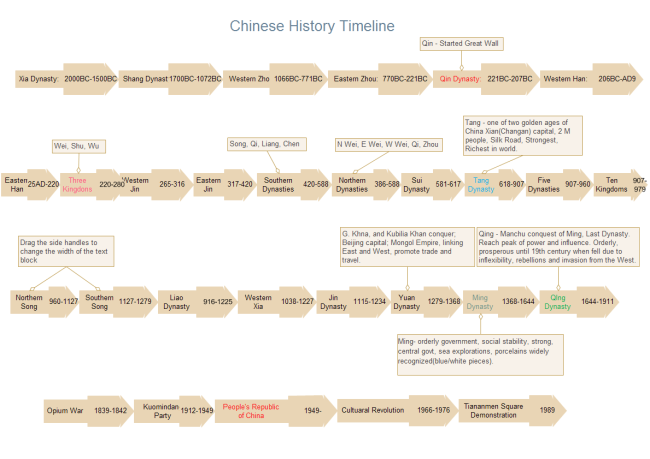 The following is an events timeline template which can be reused free. 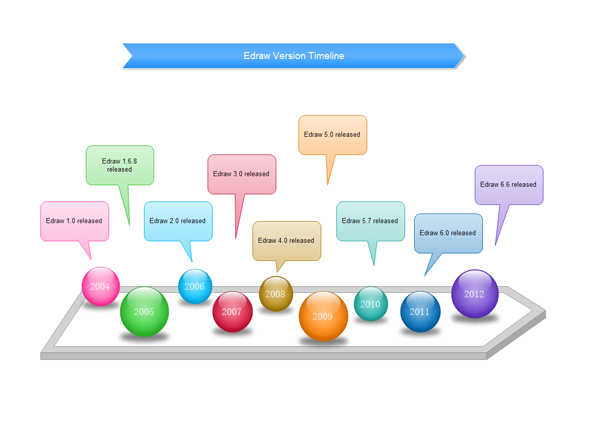 The following example represents a simple version timeline for Edraw project.